My best book news for 2010 is that my limited edition handmade book The First Writing was accepted into the permanent collection of the National Museum of Women in the Arts in Washington DC. I visited the museum in June to meet with the curator, and the book was formally accepted by the museum acquisitions committee in October. I am so very pleased to be represented in this national collection, particularly with this book which seeded much of the work I’ve made since 2004. I’ve added a show of images in the Gallery. Less than half of this edition is still available. 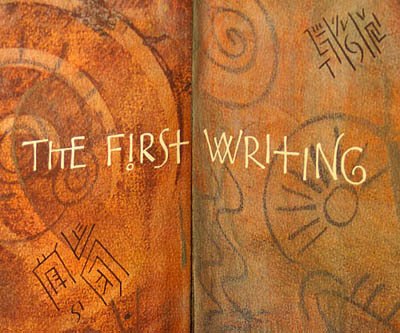 The First Writing was my first limited edition. I began by making an original book with pages painted with paste and acrylics, after first marking the paper with symbols using oil pastels. After making the accordion folds, I lettered the poem, which I composed myself, onto the painted pages, then bound the book between hard covers. Before binding it I made high quality scans of the pages and composited them in Photoshop, and then printed the pages on long strips of Arches Text Laid paper. 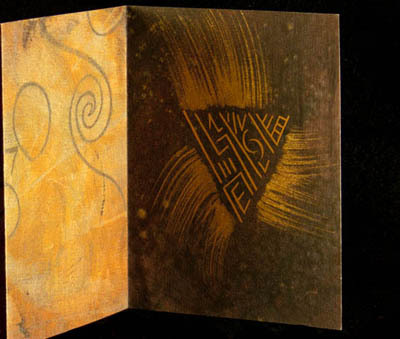 The books were then assembled by hand, the pages and cover paper accented with golden swashes and crescents, and the edition of 50 completed. These symbols from Old Europe continue to fascinate me. Our ancestors were making marks that meant something to them, though to us they remain indecipherable. They still carry that faint memory of a human hand, long ago, making signs in honor of something important, very likely something springing from the world of Spirit. I’ve written more extensively about this in an essay here. 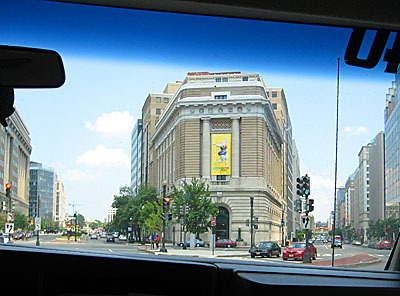 Below is a quick photo I took of the museum from the taxicab when I was leaving Washington DC. Visiting the museum with my box o’ books in tow was a leap of faith: believing my work belonged there, in a national collection of books made by artists who are women. Since so much of my work has been about women’s spiritual belief, this museum seemed a good place for work of mine to live. This collection of artists books is especially extensive, thanks to the discerning eye and years of dedication of curator Krystyna Wasserman, and is well worth a visit. Oh, how incredibly cool! One afternoon at lunchhour, I am going to hop a cab and go over there and see it. I completely “get” what you’re saying about those old symbols. If I were ever brave enough to get a tattoo . . . . Thank you for your very kind words, Linda! Hecate, that is pretty much what I was hoping anybody in Washington DC or visiting there could do. Thank you for telling me. 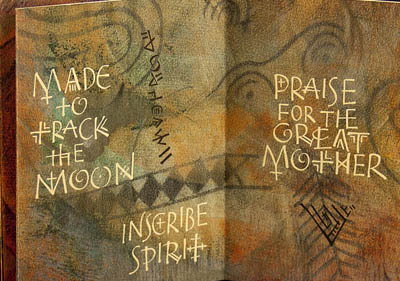 If you have a chance, ask to see Jenny Hunter Groat’s book, A Vision, a house of scrolls of Wendell Berry’s earth poems, a beautiful presentation. It is mentioned here in an older database of artists books in the NMWA. I saw it on a visit there in 1999, and perhaps it planted the seed in me of my own book there, and later I was lucky to have the personal encouragement of both Jenny and her husband Peter Groat to submit my work. As for the symbols, there is always henna . . . I wished we lived closer. We would be such good friends. Congratulations! And, you are worthy. I might be in DC next summer and I will look for your book. Thank you for sharing your journey, books, insight, words, circles. I find you to be an inspiration! So late in replying, but thank you, Rosie! The feeling is mutual. I love that we can share our work through pictures and words on the internet. So loving the beauty and knowledge that you have shared with the world. Slowly discovering more and more on your website, as you reel my interest in with tidbits on our mutual facebook sites. So nice to hear from you, Nancy! I so appreciate you. I’m glad you came by for a visit. Oh! And thank you for subscribing, Nancy!